6. Review: Discworld Diary 2015 First and Last Aid. We R Igors. Welcome to issue 210. After the hectic and wonderful month of August I was hoping that September would be less dramatic. But with two new books released I've had plenty to read and I've also had some minor surgery which leaves me writing this month's issue in bed. My apologies for the lateness of this issue. Partly it was because I've been enjoying the rest. Due to the size of this issue already, I'm holding off on the Discworld casting again this month. Discworld casting will return when we have a quieter month. A friend, and fellow Discworld fan, Adele Kirby is currently running a kickstarter campaign for an audio fitness training system called Apocalypse Survival Training: an audio fitness adventure app. The basic premise is that you are a survival of an alien invasion and must run away from the alien invasion but whereas other audio fitness systems are purely based on running, Adele's system will include full workouts. The "oookbench" that until recently was on display in London was sold off along with all the other book benches at an auction in London on Tuesday October 7th. Paul Kidby's librarian bench was one of the most popular benches and sold for 8000 GBP. If after browsing the archive you realise you have items not listed then Rachel will be happy to review photos of your items and to add them, if appropriate, to the archive. The Lego Discworld project has just over 7,000 supporters but needs to reach 10,000 to be considered for release. In order to help make this happen please visit ideas.lego.com/projects/36302 and pledge your support. BBC Radio 4 will be broadcasting a radio adaptation of Terry Pratchett and Neil Gaiman's Good Omens in December. It is due to air on consecutive days with the final being a double length episode. From the details I've seen so far there is a lot of great talent involved in the adaptation. It should be noted that this is in addition to rather than instead of the TV adaptation of Good Omens due next year. Neil Gaiman's introduction to A Slip Of The Keyboard has been published by the Guardian newspaper. Neil's thought provoking and emotive essay entitled 'Terry Pratchett isn't jolly. He's angry' is a beautifully written but hard to read account of Neil losing a friend in Terry due to his PCA. Rob (Terry's business manager) read this out at the Convention (twice) and each time there was barely a dry eye in the room. The Great British Bookshop are running a competition to win an exclusive print signed by Sir Terry Pratchett and Paul Kidby. It is part of the oookbench that was recently auctioned for charity. Visit discworldmonthly.co.uk/url/GBB210A to enter by the end of October. Literary Lacquers, founded by Amy Milder in 2012, is an innovative independent nail polish company. Amy's passion for literature, beauty and nail polish drive her creativity and business; all of her polishes are inspired by great literary works, passages and series. Literary lacquer polishes are all 3-free and are packaged and shipped with 100% recyclable materials (www.etsy.com/shop/LiteraryLacquer). In 2007, Sir Pratchett announced to the world that he is living and writing with early onset Alzheimer's, or as he refers to it "The Embuggerance". Instead of ceasing his creativity and publicity, Sir Pratchett became a financial donor and guest blogger on Alzheimer's Research UK (www.dementiablog.org, www.alzheimersresearchuk.org), and continues to write and interact with fans via social media. Earlier this year marked the first time that Sir Pratchett cancelled a public appearance due to the effects of The Embuggerance. To honour Sir Pratchett's work and his charity work with Alzheimer's Research UK, Literary Lacquers has designed a limited edition charity polish, Luggage For Your Journey. In the Discworld novels, The Luggage is a recurring character that travels, protects (at times voraciously) and accompanies the wizard Rincewind. The Luggage is otherworldly, and yet becomes integral into the fabric of Discworld. This polish is designed to honour Sir Terry Pratchett's amazing literary career, to thank him for the journey into other realms and to serve as a reminder that there is always a companion for life's many journeys. The bottles of Luggage For Your Journey will be sold for 12USD and 5USD from each bottle will be donated to Alzheimer's Research UK. The polish will be sold as a preorder only from 10/9/14- 10/17/14. To coincide with the paperback release of Raising Steam a new blog on Waterstones' website discusses Terry's influences for writing Raising Steam. Fully illustrated and replete with useful titbits, Mrs Bradshaw's Handbook offers a view of the Sto Plains like no other. Authorised by Mr Lipwig of the Ankh-Morpork and Sto Plains Hygienic Railway himself, Mrs Georgina Bradshaw's invaluable guide to the destinations and diversions of the railway deserves a place in the luggage of any traveller, or indeed armchair traveller, upon the Disc. Amazon US: discworldmonthly.co.uk/USISBN/B00O30HHTA - Kindle Only! [AU, New] The Amazing Maurice and His Educated Rodents runs 23rd September to 1st November at the Brisbane Arts Centre. TICKET PRICES: All tickets 16AUD, Group 10+ 13AUD, Gold Members 6.50AUD, Members 13AUD. Families with family membership can redeem their included season tickets for this show. [CA, New] Socratic Theatre Collective, is producing Terry Pratchett's Wyrd Sisters from October 31 - November 9 in Toronto, Ontario. Venue Box Office: The venue box office at Fraser Studios will open 1 hour before each performance. Only cash is accepted at the venue box office. [AU, New] Wyrd Sisters will run from 8 November to 13 December at the Brisbane Arts Centre. [UK] East Essex Players take a stroll through the Discworld with their production of Wyrd Sisters. Wyrd Sisters will be performed in the Dixon Studio at the Palace theatre in Southend on the 12th - 15th November 2014. Tickets can be booked online at southendtheatres.org.uk or by calling the box office on 01702 351135. [UK] Stage-Door Theatre Company will be presenting Wyrd Sisters from Wednesday 10th to Saturday 14th December 2014 at The Windmill Theatre, Littlehampton. Evening performances start at 7:30pm. Matinee performances at 2:30pm. NULLUS ANXIETAS V - The Australian Discworld Convention is coming up in a few mere months, and we are taking you to the Moving Pictures! On April 10-12, 2015 in beautiful Parramatta, Sydney, NSW, Australia, you will experience the magic of the clickies with a range of delightful activities for all types of Discworld fans. * Meet the stars of the silver screen at the Gala Dinner! * Show off your costuming and/or acting skills in the "I Wanna Be A Star" Maskerade and XXXX Factor! * Participate in Studio activities to ensure you make the best clickies possible! * Test your knowledge of Discworld and Movies and their influence on each other in our Quiz! * Support the Aboriginal Literacy Foundation at the Charity Auction! * Be crafty with chain maille, knitting, card-making and more! * Can you sing? Dance? Handle a sword a little? Learn all these skills and more at our workshops! * And much more to be announced! Tickets to the convention (and the Gala Dinner) are on sale now! could be as lucky as an Oswald winner! We now have as special guest at Cabbagecon 3 the Dutch translator Venugopalan Ittekot. [DE] With a 1000 camels the German Discworld Convention moves to the mysterious continent of Klatch! Make room in your schedule from September 10th to 13th in 2015 for the fourth German Discworld Convention at Castle Ludwigstein. Be there when it's getting hot! [IRL] The Irish Discworld Convention 2015 will take place in Cork, Ireland at the Cork International Airport Hotel from the 2nd to the 5th of October 2015. Join us as a Special Constable for the Watch Open Weekend. [Perth, AU] The Perth Drummers have changed their name. They are now known as the Treacle Mining Corporation in honour of their beloved state. They still meet up to celebrate the works of author Sir Terry Pratchett, and welcome any fans of science fiction and fantasy. [AU] Sydney Drummers normally meet on the first Monday of every month. We assume any correspondence is eligible for use in the newsletter unless otherwise stated, including the sender's email address. We may edit your letters while under the influence of prescription drugs. Are there any Discworld Meetings in or around Melbourne, Australia? Please take a photo of the front and back, especially the back, so that I can see what art was used in that year's calendar. If you have one of these, please forward your details to me via the Discworld Monthly Newsletter [ - Ed], and I will e-mail you directly. Thank you. 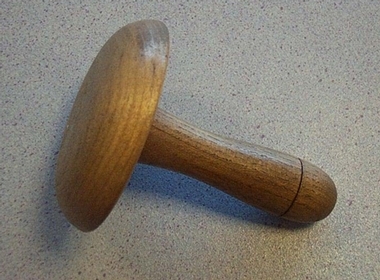 Image of a darning mushroom! DWM replies: Yes, we can see how that might hurt if used (in)correctly. Are there any Terry Pratchett Societies / Clubs / meetings in Bristol, UK or anyone interested in Discworld or Terry Pratchett Books in General. Or are there any of his plays being acted in Bristol. Reading through every Discworld Monthly, I find that Bristol does appear a little left out on this subject. DWM replies: Well, are there any fellow Bristolians that can help Dave out? Last month in the trivia I asked who is Keith? And was expecting the answer that he was the "stupid looking kid" according to Maurice. I have since been informed that one of the Ankh-Morpork hippos is also called Keith (the other is Roderick - see Feet of Clay) so my apologies for any confusion. Which dead Archchancellor's pickled body still "resides" in the UU? What line of work is Tuttle Scrope known for? Where was Lars Larsnephew born? Dragons at Crumbling Castle is a collection of fourteen stories written by Terry as a teenager when he was a junior reporter at the Bucks Free Press. The stories are just a selection of those he wrote in a weekly series for the paper. You may even recognise a couple of the stories because they became the basis for Terry's first novel. Tales of The Carpet People and Another Tale of the Carpet People are both considerably longer stories than the other twelve - and possibly show which characters Terry had more interest in developing further. According to Terry's introduction most of the stories appear as they were first published but with the odd tweak here and there. One thing most of the stories have in common is their simplicity. Don't read this expecting the same prose that you get in the Discworld series. These stories whilst funny were written by a young man learning his skills. The character names, while funny, are often very cheesy. Whether that is because they were funny or they were written that way to meet a particular audience it is not clear. Each of the stories has its own charm - it's a very simple book to read and really is aimed at children. Most of the stories are a build up to a simple punchline that are quite clearly signposted but still make you chuckle or groan depending on when you work them out. I really like this book. It gives a beautiful insight into just how much Terry developed in his career from a young inexperienced author from those early days as a journalist into the wonderfully confident master craftsman he became. Well worth a read for any Pratchett fan. After a considerable absence the Discworld Diaries are back. This time produced by the team at The Cunning Artificer in Wincanton. We R Igors is a beautifully illustrated week per double page diary. Being an Igor diary you can expect there to be some lisps. For example the month after July is listed as Augutht and the following month Theptember. Each week includes the full 7a days - Monday to Octeday - and normally has a funny / anecdotal piece about Igors in the Octeday section. For example the Octeday in week commencing July 6th suggests: The Ear-mouse is just one of the many new "Beathtieth" appearing as a by-product of bio-artificing. Nosey the rat and Lippy the frog are also contributing, in their own way, to this new science. Testing on animals somehow seems more sporting; a radish can't run away. The diary is full of fascinating bits of information including but not limited to Igor donor cards, Igor family trees and standard contracts of employment for Igors, including the inevitable get-out clause should the employer upset the locals and they turn up with flaming pitchforks. While the diary can technically be used as a diary, it's almost too nice for that. I suspect the answer is to purchase two copies. One to deface, use and enjoy and the other to keep as part of your collection. My copy came direct from The Cunning Artificer's shop and came with a beautifully illustrated approximately A3 poster (that I've now put in a frame and mounted) of many of the Igors and Igorinas that feature in the diary. We've been in touch with Sasquan (WorldCon 2015, in Spokane, Washington) about the Discworld panels we'd like to see offered there for The Great Discworld Fan Gathering at that convention. We have suggested, among others, the ever popular NADWCon panels titled "The Science of Discworld" and "The Tech of Discworld", "The Women of Discworld" and "Folklore, World Myths, Ancient Legends and The Discworld". Are there classes, panels, events, or meets you'd like to see there, either for kids or adults? Let us know using the link noted below. We can and will suggest the names of people many of you folks know from previous NADWCons for these panels and events, and we are always looking for new people who can add to our sum of knowledge. For further information on Discworld Programming at Sasquan, please follow the blog "It Bodes" (it-bodes.blogspot.com/) and/or like and follow the facebook/Twitter pages for North American Discworld Convention (www.facebook.com/NADWCon). At the Discworld Convention the Discworld Emporium launched a new 1000 piece jigsaw, showing the city of Ankh-Morpork. It says on the box, 'Not suitable for children under 3, people with short attention spans or those of a nervous disposition.' Can it really be that hard? Well, I did it, and it took me about 25 hours - and I am not a novice at jigsaws. The detail is amazing, even at the finished size of 69cm by 48cm, and you can make out not only the individual houses and buildings, but also people and animals in the street. This is that same pic that forms the back of the double sided map in the Compleat Ankh-Morpork book, which I would recommend if you want a bigger scale guide. The box lid really doesn't do it justice, and will give you a headache if you try to look at it as a guide. You can, and generally will, need to do it just by seeing where pieces fit, but the different city parts have different styles and colour plans, so that helps. And you really need good light for it. Is it fiendishly difficult? I'd say yes, and the staggered offset cut, like the old Spears jigsaws, helps with achieving that. Will I do it again? Give me a few months and yes, it will come back out of the box. Would I recommend it? If you like a challenging puzzle, and can spare the table for enough hours, have patience and determination, then yes, it really is a challenge. The once Queen of Skund according to Casanunda. Archchancellor "Trouter" Hopkins' will stipulated that his body be preserved after his death so that he could continue his own work. Copyright © 2014 Discworld Monthly.